Most cats on the job got hired (actually, adopted through an agency or shelter) but Chester the cat pranced in to Chestnut Square Historic Village in McKinney, Texas. He didn’t need an interview or a new hire package because he’s the classic self-starter, he knew exactly what to do by pouring on the charm and showing off his skill in historic buildings and antiques. Read his story here and read about his book, which he had help with typing from a ghost writer. 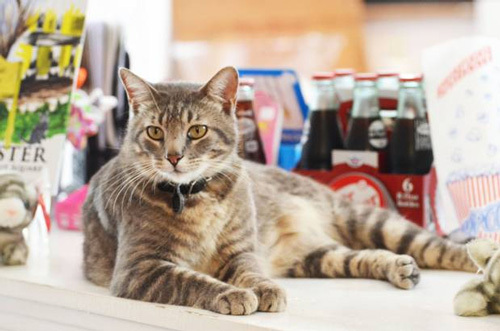 Did you miss our recent feature about Cats on the Job based in San Francisco? They place cats who might not be otherwise adoptable in businesses. We’ll re-run that story for you again. If you feel inspired to copy-cat their program in your community contact them and they’ll get you going. Do you know of any working cats? Send us your story and picture about a cat or cats on the job and we’ll put it on our Facebook page in the newsletter it. Or if you find a newspaper or magazine article send it to us with a link.